Super Jelly is a free puzzle game that is developed for Windows 8 and 8.1. The puzzle game is similar to the other puzzle games. 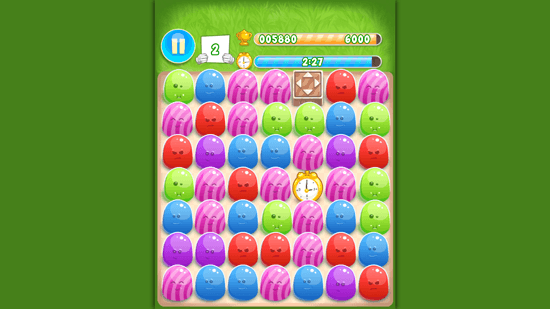 In this puzzle game, you have to pop the jellies in combination of more than one and the color of the jellies to pop has to be same. As the game keeps going on and you keep clearing different stages, you will come across other different and interesting things as well for example new bonus moves, bonus things to collect, etc. In the game, a timer runs and you have to collect the specified points in the time allotted. If you are unable to collect the given points in the given time then the game will get over and the stage will not be cleared. There are numerous stages and levels in the game that makes it more fun and exciting. To reach new levels you have to clear the present one first. The bonus points can be achieved by popping larger number of jellies together or by popping the bonus objects like a jelly box, timer, etc. When more than five jellies of same color are set in one row or column, they pop to create a new jelly which is of rainbow color. This rainbow colored jelly can pop all the other jellies in the game play with which it is swapped. The design of the game is nice and has really good color combination. The game has bright colors like green, red, pink, purple, blue, etc. As the game is designed and developed for a vertically long device, on Windows 8 and 8.1 desktop it covers the side areas with green color matching the background of the game. If you love playing puzzle games in which you have to pop up elements together then Super Jelly is a perfect game for you.